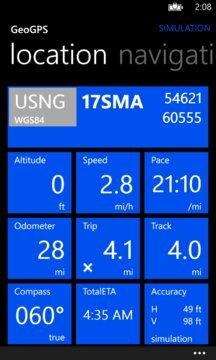 Turn your Windows Phone to a full-featured hand held GPS device with this App. 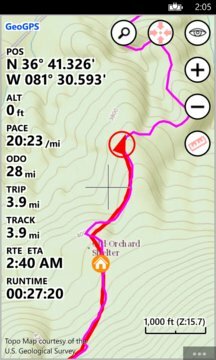 Designed for navigation, finding directions and planning outdoor activities or at sea. Suitable for work with paper charts and plans even beyond WGS84. • More than 10 coordinate systems and formats, many common variations and local grids (geodetic, UTM/UPS, GEOREF, MGRS, USNG…). The list is continuously expanding. Use the free trial version to test this app on your device.